The Irish band Aslan is one of my favourites. Their lead singer, Christy Dignam, has an incredible voice and is often my go-to artist when I need to unwind and relax. He sings with such passion; you sense that he believes every word and note. Listening to him is almost a religious experience. Christy really lived the rock ‘n roll lifestyle and had more than his fair share of problems along the way—even getting dropped by the band for a period of time as a result. Thankfully, he eventually emerged out the other side of his problems and continues to entertain us today. As he emerged from his troubles with drugs and alcohol, he and the band recorded the song “Crazy World”—one of their biggest hits. The song, the opening line of which is “How can I protect you in this crazy world?”, reflected on Christy’s sense that he couldn’t protect those he loved when he kept failing himself. Sometimes when I listen to this song, I think of the cyber-security industry and the mammoth task of protecting customers. I remember my first time visiting the RSA security conference. I was really excited to be going there, partially because San Francisco is my favourite US city and I had only been there a couple of times previously. However, on entering the Moscone Center where RSA is held, I felt quite intimidated by the sheer size of the place and the huge number of exhibitors. How was my company going to stand out from this crowd and make an impact? But as the crowds streamed through over the following days, I felt they had an even tougher job in terms of selecting products to protect their organisations from malware, apart from those attendees who were there simply to collect lots of free stuff! It is exhausting just to walk around the Moscone Center and visit the various stands and understand their messaging. It is even tougher to take all that information back and develop a coherent strategy to protect an organisation. That is why I really like the Center for Internet Security (CIS) and their security framework, the CIS Critical Security Controls. On their website they describe the CIS Controls as “a prioritized set of actions to defend against pervasive cyber threats.” They have a total of 20 controls and their message is to start at the top and work your way down. Each step along the way, you are maximizing your impact on improving your defences. This is particularly true of the first five controls, which are the things that you must do to create a strong security foundation. In other words, get these in place first and build from there. It removes a lot of the mystery in how to get started and how to develop your security strategy. 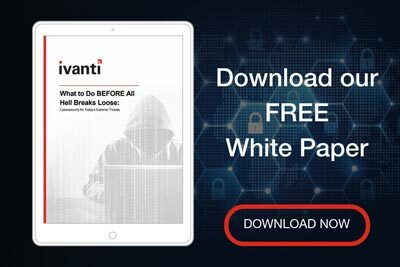 At Ivanti, we’ve aligned our security solutions and our product strategy to these CIS Controls. With our strong heritage in asset discovery, vulnerability management, application control, device control, and privilege management we can help you get your cyber-security foundation in place. Come and talk to us. Maybe we can protect you in this crazy world. David Murray, based in Ireland, is an IT industry veteran and Ivanti product manager focusing on bringing to market application control technology as well as integrated endpoint security solutions.